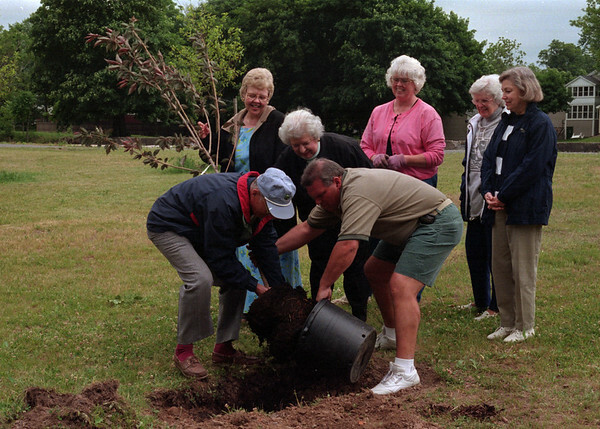 98/06/03 Tree Donation * Dennis Stierer Photo - A new tree donated by MATABC, Middleport Area Tourism And Beautification Committee was planted at Margaret Droman Park in Middleport. Helping to do this great deed is Bob Querns, with the Tree Committee of Middleport and Don Piedmont, mayor of Middleport. Watching (from left) are Liz Storch, with the Tree Committee; Margaret Droman, after whom the park was named; Julie Maedl, with MATABC; Betty Querns, resident of Middleport; and Janet Lyndaker, also with MATABC. Janet Lyndaker requested that this run in all of our newspapers, including Medina, and Medina supplement. I told her that was up to the editors.